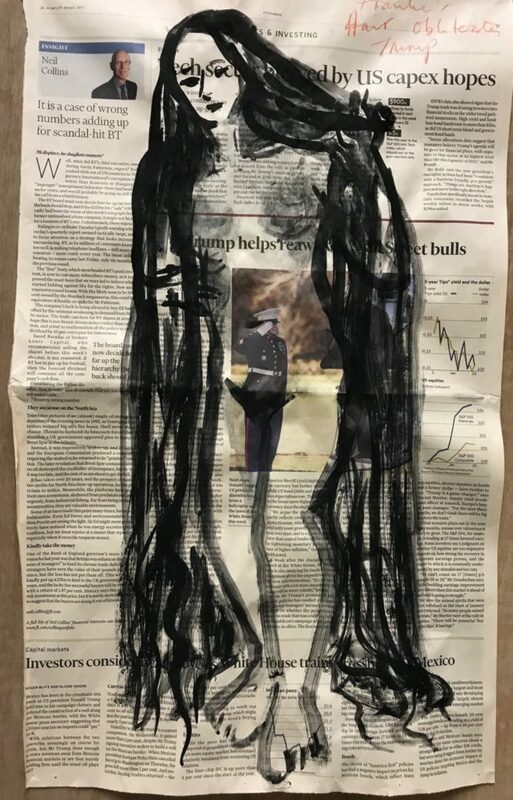 “Frankie’s Hair obliterates Trump” pictured on the opposite page and “Less Waste more Seed” in the current museum exhibition at Burgh House are works from my “Financial Times” series. The series originated as a means of recycling paper and for reasons of economy on a day when I had no drawing paper in the studio and decided to use the old newspapers that I brought in to protect the floor from dripping paint when I am working. But I soon became excited by the aesthetic and symbolic possibilities they offered. 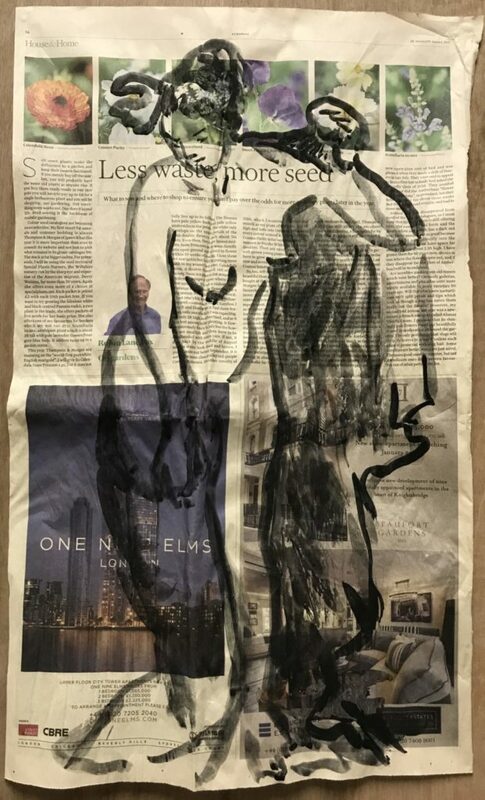 There was an element of discovery through apparently random juxtapositions but also when I selected from among the pile of newspapers in a more conscious way, choosing particular headlines, articles or photos and painting over and around them instinctively. All the works feature a woman, painted in black ink on the pink paper: here, it is Frankie, my long-time collaborator and friend, professional model, performer, weaver of stories. I have been working with the female body as both motivation and subject for over 30 years, alone in my studio or with my collaborator. The woman I depict is a strong questioning presence: my alter ego. Drawing and painting the naked female body originated from my own sense of my body in space. I have worked as a model in life classes and also drawn myself naked at various times, in pregnancy and, more recently, studying my more mature self. The subject of the female gaze is a central concern. When I started to work one to one with another woman, I chose women who were also dancers, who could convey the qualities that I felt within me: grace, strength, vulnerability, anger, fear. The work becomes a collaboration as I try not to impose, but am interested in the individual. In Frankie’s case, a distinctive feature which she uses to convey many different moods and “stories” is her floor length hair. Sometimes it rains down as it did serendipitously over the photograph of Donald Trump. In the “Less Waste..” image it is piled up as in a classical statue but with a flower that echoes the flowers in the newspaper image and draws our attention to ecological and environmental concerns. The fact that the newspaper in question is the preeminent international paper of the financial and business world gives it additional resonance. These images of women painted in black on the faded pink paper recall the narratives of Greek black figure vases and shift “the news” from the momentary to the enduring. I paint on the FT, but I also draw upon its content, buying the Weekend edition for its varied articles on gardening, the Arts, culture and its perspectives on national and international news. My various letters published in the FT, including the most recent: “Rewriting our Myths about women”* and “Not “women artists” – simply “women””** reflect my credo as an artist and a woman.